How to control the speed of three phase induction motor? The speed control method includes: changing the number of poles, stator voltage control, stator frequency conversion, cascade speed control, double-feed speed regulation, hydraulic coupler, electromagnetic slip clutch, etc. The actual speed of three phase asynchronous motor is given by n=ns (1 - s) =120f /p (1-s). It can be seen from the formula that the speed of 3 phase induction motor can be changed by the means of changing the number of induction motor’s poles "p", the slip "s" and the frequency of power supply"f". But it cannot get a smooth speed regulation by this method due to its large grade difference. Therefore, it can be used with voltage speed control and electromagnetic slip clutch, to obtain a higher-efficiency smooth speed regulation characteristic. This method is suitable for production machinery without stepless speed control, such as metal cutting machines, lifts, cranes, fans, water pumps and so on. The torque of an induction motor is proportional to the square of the stator voltage. That is, the change of the stator voltage can change the mechanical characteristic and torque of the motor. This method is not suitable for the ordinary squirrel-cage motor, because its rotor resistance is very small and the current will rise rapidly at the low speed. But it can be used for the wound-type induction motor by series resistance or frequent varistor in the rotor circuit to reduce the heat of the motor. This method of speed regulation is only applicable to the winding motor. In the rotor circuit of induction motor in series with resistance, when the load is fixed, the greater the resistance, the lower the speed of the motor. The smaller the resistance, the higher the speed. This method is simple, easy to control, and has low initial investment. But the slip power is consumed on the resistance by heating. It also has soft mechanical characteristics. At present, the cascade speed control takes use of SCR inverter cascade control circuit, and has the following advantages: get stronger mechanical characteristic, low rectifier voltage drop, small space, no rotating part, low noise, simple maintenance. It is one of the speed control methods of wound-type motor. It also has its own disadvantage. That is, the rotor circuit is equipped with a reactor for filter, so the power factor is low. 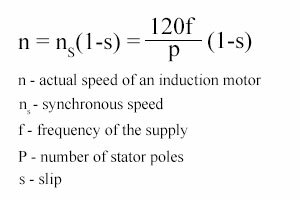 According to the speed formula of induction motor, it can be seen that when the slip s remains constant, the motor speed n is basically proportional to the power frequency f. Therefore, changing the frequency f can regulate the speed of induction motor smoothly. Changing the frequency of power supply is a economical speed regulation method, and it is also one of most popular ways of induction motor speed control. Variable frequency speed control is a way to change the power frequency of motor stator and then change its synchronous speed. The main equipment of variable frequency speed control system is frequency converter or variable frequency drive (VFD) that provides frequency conversion for the power supply. 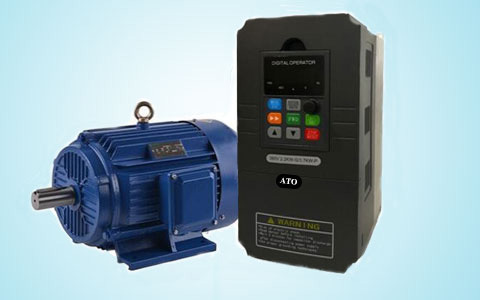 The variable frequency drives can be divided into two categories: AC-DC-AC VFDs and AC-AC VFDs. High precision smooth speed control. Complete protection function, able to display the fault by self-diagnosis, and simple maintenance. Starting directly on line, with large starting torque and small starting current, which reduce the impact on the power grid and equipment, and having the function of lifting torque, thus saving the soft start device. High power factor, and save the capacitor compensation device.